It's the cocktail hour, its cabaret o'clock! Starring international showgirl Ivy Paige! 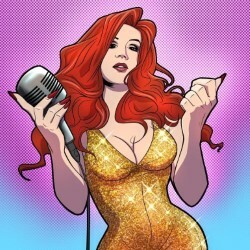 'Real-life Jessica Rabbit' (Sun), with legendary pianist Pete Saunders (Dexys), she celebrates the glamour and music of the golden era of Hollywood in this live music cabaret. Ivy seduced the nation and judges on ITV's The Voice. 'A firecracker' (Sir Tom Jones). She'll be saucily singing and swinging with her own naughty twist in Le Monde's glamorous Dirty Martini lounge. 'Vintage vibes and sensational vocals’ (BroadwayBaby.com). 'A modern-day Mae West' (Evening Standard). 'Her voice is a powerhouse' (EdFestMag.com).